Yet another reason to never visit Darwin. If it was a prank, it was a pretty mean-spirited one. A saltwater crocodile was found sharing a public swimming pool with a group of oblivious bathers in northern Australia. 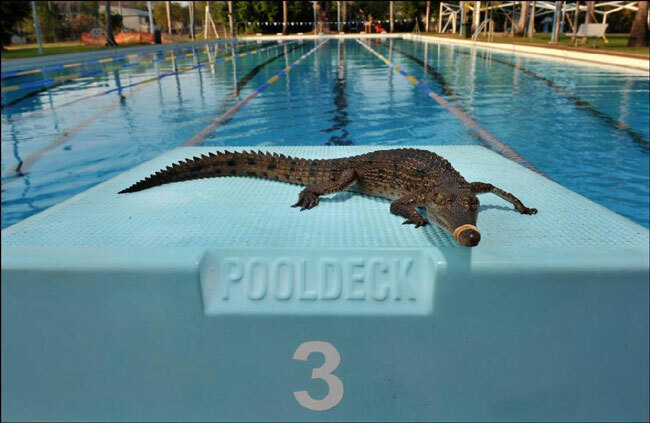 Brave lifeguard Tim Dupe, 54, fished out the crocodile from the shallow end at the Parap swimming pool in Darwin. He said the pool was holding a swimming boot-camp at the time but luckily the reptile “had a lane to itself”. Fortunately for swimmers, the croc was just a baby and only 50cm long. Ranger Tommy Nichols thinks it was put in the pool as a joke and added that it was the third crocodile to turn up in a public pool in the past few years. He said: “They didn’t get there by themselves. It’s just a stupid thing to do.